This page will give you an overview of the basic swimming strokes that are currently taught in swimming classes. We will also discuss the advantages and disadvantages of each swim stroke. The breaststroke is often the first of the basic swimming strokes taught to beginners. The modern breaststroke kick is, in fact, a whip kick. The phases of the arm stroke include a recovery forward, an outsweep, an insweep where the hands meet below the chest, and again the recovery. All arm and leg movements occur below or at the water surface. One of the advantages of the breaststroke is that at a fundamental level, the head can always stay above water. This gives excellent visibility while swimming and avoids breathing issues. Another advantage is that both arms and both legs execute the same motion synchronously, which makes this swimming stroke one of the easier ones to learn. The main disadvantage of the breaststroke is that it’s slower and less efficient than the other strokes. Backstroke is often the next stroke taught to swimmers. As its name suggests, it is swum on the back. The backstroke kick is a kind of flutter kick, which means that the legs alternatively kick up and down. The arms execute kind of an alternate windmill-like motion. The straight arm recovers above the water in a circular motion from the hip to an extended to the front position, then catches and pulls under the water from the extended front position back to the hip. One advantage of the backstroke is that as it is swum on the back, breathing issues are avoided once the swimmer has good balance. It is also more efficient than breaststroke and can be swum for long distances. As it gives the back an excellent workout, it is also often advised as a remedy against back problems. Backstroke is a slower swimming stroke than front crawl or butterfly. For novice swimmers, it can be challenging to find balance on the back and then breathing becomes an issue as the nose is up and water can easily enter the nose. Finally, it can be uncomfortable for beginners to not being able to see in which direction they are swimming. Front crawl is swum in a horizontal position with the face turned downward. The legs do a flutter kick, which means they alternate moving up and down, in opposition and with the feet pointed. The arms move simultaneously and perform similar movements, but shifted in time. While one arm moves underwater from a forward extended position toward the hip, providing propulsion, the other arm recovers above water from the hip toward the forward extended position. The advantage of front crawl is that it’s the fastest and also most efficient swimming stroke. Because of this, front crawl is used nearly exclusively in freestyle swimming races. Also, distance swimmers nearly always use front crawl as it allows to cover long distances while wasting the least amount of energy. One of the difficulties of the front crawl stroke is that the face is in the water most of the time, and to breathe you need to turn your head sideways at the right time of the arm recovery. This makes front crawl one of the more difficult swimming strokes to learn. The butterfly stroke is both the most beautiful and most difficult of the basic swimming strokes. The body executes a wave-like undulation which starts in the arms and head, travels down the body and ends in the legs and feet which snap like whips. The arms execute a motion like that of the front crawl, only that both arms move synchronously. From an extended to the front position, they pull back under the swimmer’s body to the hips, then are thrust sideways out of the water and recover to the front above the water in a quick circular ballistic motion. The advantage of the butterfly is that it is also very fast, faster than breaststroke and backstroke but slower than front crawl. It is also a stroke that is a lot of fun because of its unique dolphin-like body undulation. The butterfly stroke is quickly tiring as it requires a lot of strength. It is also challenging to learn as it requires both an excellent wave-like body undulation and perfect timing for the arm recovery to occur. 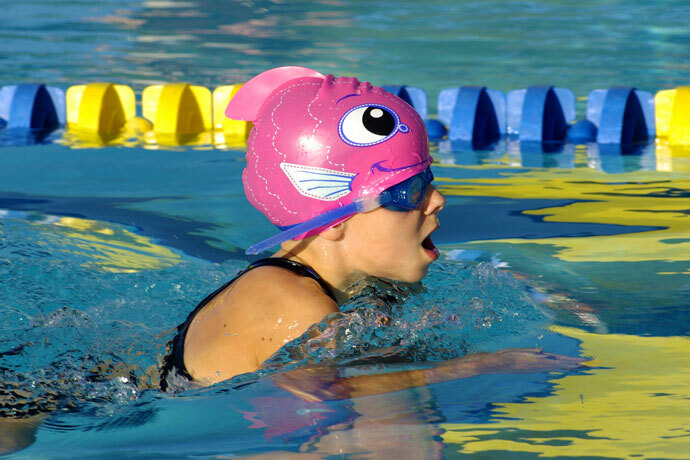 We have discussed the advantages and shortcomings of the basic swimming strokes. You could now start to learn how to swim these strokes. Have fun! Why Learn Several Different Swimming Strokes? Fun fact coming from a competitive swimmer: You can literally swim any of the four official swimming styles (fly, back, breast, free/crawl) in a freestyle race without getting disqualified because it is a free style event. However, since crawl is faster, most people choose to swim that style. Notice, it never prevented this guy in my club from swimming an 800 free in butterfly, just to prove to everyone that he is insane! No you can not, I am a swimmer in Indiana and these are not the rules. Listen Grace, you are wrong. My daddy is a swimmer and he knows the rules. I am so on your side. I agree. I bet your dad A is a great swimmer. I am one too. I am on level 7-8. I am always talked about for being the best swimmer in class and on my team. I am a boy so it is easy. I don’t have to worry about my hair getting in the way. I am doing a project about swimming. So I need some facts. I could use some help from A and Grace. Crystal does not sound like she has good and useful info. Listen -A you need to get more info too. I will like to prove people wrong. Puppy paddle is NOT a swimming stroke. Yes it is! It’s the only thing I can do cuz I get woozy.